I have a cold. A common or garden head cold complete with red nose, dry lips and super velocity sneezes that elicit the response from my husband, “Do you really NEED to do that?” Yes I do. I’m always amazed at how down such a simple illness can make me feel from the scratchy throat and lead weight around my head to the heaviness in limbs and spirit. I know this will pass: it’s transient, insignificant, a nuisance at most but, maybe the most important aspect is giving me a ‘breathing space’. An oxymoron – and an interesting choice of word given I’m very aware of breathing with blocked airways and consequent dry mouth. All this – and a cancelled session this morning – has given me that breathing space: and I hadn’t realised how much I was in need of that. I’ve been pinging from job to job to thought to thought and chasing opportunities – much like a bagatelle ball. I’m tired, and relishing a little enforced downtime without the guilt factor creeping in. This little guiltless idleness has helped me understand and illuminate some tensions within which I’ve been avoiding or suppressing. My energy levels are not what they were – and I’ve never been a dynamo if I’m honest. More a short burst and retreat to recoup kind of existence. I’m realising how best to manage this to sustain me and, enable me to offer what I can in terms of DMP work and other activities. Also, what may need to be let go or change their emphasis. These things have been important, vital in many ways and led me to where I am now but, the passion is now waning and I can no longer include these in the same way I have done for 20 years. I’m allowing these reflections to incubate and crystalise much as the cold virus invaded and multiplied in my body before exploding into consciousness. Thank you little germs – you have given me a germ of my own to grow and inspect and assess its possibilities to cure, heal or destroy, albeit constructively. This feels painful but necessary and I’m beginning to feel the beginnings of relief and a lighter mind. The last time I wrote it was autumn and I was basking in the remembered warmth of a late holiday. Now we’re approaching the end of February with the promise of spring in greening hedgerows, the softer air, and in lengthening days. Yesterday though, with Doris making her presence felt and starting play therapy with a new young client, I came to thinking about how both suddenly, and slowly, our lives can change and outside our control. Whether from a shocking event that upturns settled family life – like wind bringing down trees and buildings – or the transitions occurring with age from puberty to adulthood, menopause and ‘third age’. Much of what happens to us in life can feel like that storm – chaotic, wild, dangerous, destructive and frightening. Yet, after that chaos and mess, some good can be found. The storms of winter remove dead wood from trees allowing new growth, the winds drive out dark clouds to reveal sunshine and blue skies. The storm seems to release energy and tension giving an opportunity for calm and reflection. Looking around me today, our garden city strewn with the aftermath of the strong winds that made feel like Dorothy before Oz, I am reminded of the value and parallels of these tempestuous times. Not just to nature but to my self also. Without these, there can reside a tendency to cleave to the status quo, to be on an even keel, to know where we are – for safety and certainty. Yet, therein lies stagnation, fear, inactivity and inwardness, inhibiting creativity and the potential for experience, wisdom and insight, enriching and fulfilling our soul. We need those storms, painful, bewildering and disturbing though they be, as they stimulate us to grow, to look anew at ourselves, to release that we no longer need or benefits us. ‘Let it go’ says the song so, as the trees let go, I’m learning to let go of who I used to be and finding a new way of being as no longer young. This transition, unlike the sudden storm, has been slow and difficult, and inevitable. A workshop I attended recently prompted me to reflect deeply, unwillingly, on who and where I am now, holding up uncomfortable recognitions – repressed feelings of envy, self-hatred and frustration with my inability for action due to base beliefs of inferiority and incompetence. These dark clouds have now lifted a little, the storm an apt metaphor for this recent psychic struggle. I have passed through more than just the eye of the storm. I will find serenity and the calm today so embodies. I am alive. I am here. I am me. Oh it felt so good to move and be with a group again: to experience those moments of blissful, spontaneous, synchrony, and attunement. This was my first paid ‘gig’ as a DMP, although I wasn’t offering therapy at all: the workshop was called ‘Expressive Dance’ and held at a centre for various complementary therapies and movement classes. The web ad and poster specifically invited ‘over 50s’ and those who had yearned to dance but never felt able to try. The workshop mainly delivered what it promised: 3 of the 4 attendees were indeed over 50, although one of these included me! All three members – not clients – were also united in their desire to move. But, I had two hours to fill. I made a playlist, edited it, edited it again. I decided what not to wear and painted my toenails. Finally, I put my mind to the actual content. I elected to have a ‘coathanger’ on which to base the workshop, an image that led strangely on from the yellow coat fitting of the previous post. 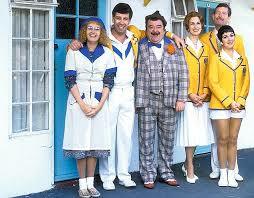 Yellow coat – whah – I’ve just noticed that sounds like Hi Di Hi…. one of my most hated programmes ever yet loved by many. “I want to be a yellow coat” was the plaintive cry of Peggy, Su Pollard’s character: was that what I felt about being a DMP? And there I was thinking it had been about fitting into a new identity, trying it on, and making alterations to suit. None of it: this was pure yearning to do what I had trained for, yet felt so tauntingly out of reach. As I had been reading ‘Beyond Dance’ by Eden Davies on Laban and Lamb’s work within business, I was inspired to use LMA shaping and efforts to underpin the workshop content. This worked well. I didn’t immediately introduce the concepts: we first warmed up and moved as a group, each being given the opportunity to lead by changing the movement in gradual ways, encouraging involvement and confidence. After we had moved in this format for some time, with swaying arms, swinging arms, flicking hands and twisting torsos, we had a moment’s break, I then brought in shaping in planes, then efforts, drawing attention to how we had moved earlier and described these movement components. As a group we also embodied these, adding images to help somatic comprehension. Later in the workshop, I used the ‘name game’ to generate individual movements which we could share, put into sequence, and expand upon. The elder of the two women seemed undecided about her movement but, encouraged by the imagery of the door plane we’d explored, she stepped forward boldly and opened her arms into a wide vase-shape as she said her name: accompanying this with a confession that “I never do this” (making her presence known). I felt moved and itched to do more work with this woman. Next, came a short exploration of the props, mostly the mesmerising ribbon wands which weaved magic in the room, conjuring metaphor and play. The elder woman went to find an instrument “a drum” as she wanted to make a noise. She settled for maracas and we moved a stretch cloth wiggling and rippling to her rhythm. As this section came to a close, we regrouped into the corner where the props were laid out. Without words, we each chose an instrument and began a multi-layered percussive rhythm, adding our own personal signatures, ending with a bang on the tambourine, followed by full silence. After a cool down and relaxation, I asked the group about how it had been for them: relaxing, losing tension, feeling freer. Feelings and sensations I could identify with closely. We finished by leaving something in the room, in the middle of our circle. I gave gratitude for how the group had embraced the workshop and their courage in trying something new. The elder woman blew a kiss to the circle centre, the younger, a ribbon swirl. The other member, a man, gave a simple formal bow. I came home hot, elated, exhausted but happy. Despite only a small group it had happened, and I had held it together, psychologically and physically. Now I’m hungry for more. Yes, I am a yellow coat – albeit one with ‘P’ plates. I read a quote the other day that said ‘medicine treats the body, but art heals the soul’ or words to that effect and it struck me how necessary it is to recognise this distinction and symbiosis in our increasingly technologically driven world. Now, there’s nothing wrong with technology per se – it’s what I’m using now – but with many things in life, it’s a question of balance. When societies lose sight of the worth of cultural arts – and participation in them by everyone not just an elite few – then we’re really in trouble. Yet this leads on to the tricky issue of evidence base and ‘proof’ that something works and why it does. Many people accept what scientists tell us about quantum physics and nanotechnology and quarks etc – without needing to understand the principles. Yet, with the arts and well-being, it seems there is much more cynicism about the value and impact – despite arts having been around since the dawn of civilisation, albeit in rather simpler forms. Cave paintings and Egyptian friezes must say something about need for expression and the human condition and the creative drive that underlies all our development: including that of the technological explosion. Participating in arts connects people, whether in dance, music, drama or art and allows people to express, communicate and respond at a deeper level – even where language might prove a barrier. I’m ecstatic that the arts and creativity seem to be enjoying a little renaissance, especially in the area of healthcare for young and older people. Medicine and surgeons can do wonderful things but not heal the psyche and as the famous ad once said, arts can refresh the parts other treatments cannot reach. I am going to hold on to these thoughts as I continue my process in creating work opportunities for therapeutic dance and Dance Movement Psychotherapy. This kind of work IS needed and vital to bring us back into our bodies, reconnect at a physical level, and celebrate the human spirit. This new journal from the Arts Council – Create – is a fascinating insight into how wellbeing and the arts are inextricably linked. A survey accompanying the publication found that two thirds (64%) of adults think the arts can improve people’s overall sense of wellbeing and three in five adults (60%) saying that having more arts and culture in their local area would make it a better place to live (from People Dancing website).